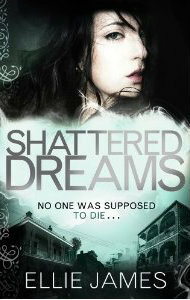 Ellie James, author of Shattered Dreams featuring teenage psychic Trinity Monsour, joins us today to preview a few big lessons coming out of her YA thriller, Shattered Dreams. Life as a psychic can be rather bizarre, especially when you’re sixteen and living in the most haunted city in America, when everyone in your life was a stranger six months before, when secrets lurk around every corner and every now and then you have these….dreams. Dreams you don’t understand. Without time- or place-stamps. Dreams that terrify. Oh, yeah, and the wrong guy has a way of showing up at exact the right moment. 1. Not all dreams end when you wake up. 2. The truth can be far more dangerous than a dare. 3. Being on the outside looking in is sometimes far better than being trapped on the inside. 4. Seeing things that aren’t there doesn’t always mean you’re crazy. 5. A smile can be the most dangerous disguise. 7. Sometimes when you close your eyes, you can see far better than when they’re open. 8. Silver is far more than a color. 9. Just because you don’t remember something doesn’t mean it didn’t happen. 10. Opening your eyes in the wrong guy’s arms isn’t always…wrong. 11. Morgues aren’t fun places. 13. Once open, some doors can never be closed. 14. Only a coward lets fear stand in their way. 15. A single kiss can change everything. The firstborn daughter, of the firstborn daughter, of the firstborn daughter, sixteen year old psychic Trinity Monsour has a connection to the Other Side. She knows secrets and truths she shouldn’t, feels emotions that do not belong to her, and see events that have yet to happen. They come to her as glimpses, shadowy, disjointed snapshots that flicker through her dreams. Some terrify: a girl screaming, a knife lifting, a body in the grass. But others--the dark, tortured eyes and the shattering kiss, the promise of forever--whisper to her soul. They come without warning. They come without detail. But they always mean the same thing: The clock is ticking, and only Trinity can stop it. This one sounds so interesting! The covers slightly putting me off though cos it looks a lot like the Shade of London series from Maureen Johnson… But great post and I look forward to it!